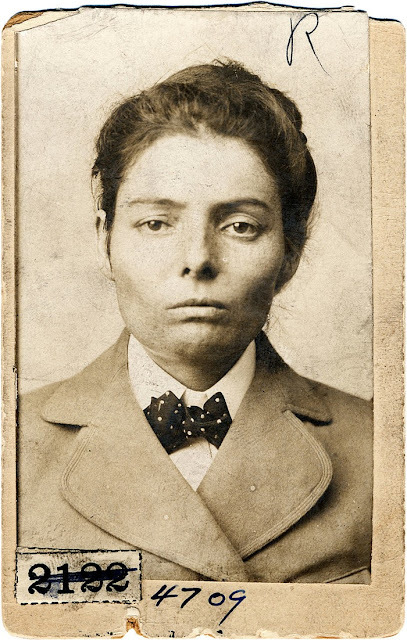 Laura Bullion: Whore, Fraud Artist, and Robber of trains and banks. Poor Laura, all she ever knew was a life of crime. She was introduced to crime early in her life. Her father was a notorious bank robber. At the age of 13, she became a prostitute. When she was 15, she became romantically entangled with William Carver and began to run with notorious outlaws Butch Cassidy and the Sundance Kid of the Wild Bunch. Of course, it was only natural for her to help out with a few robberies here and there, and was known for disguising herself as a man. She earned the moniker "Rose of the Wild Bunch." She continued to work as a prostitute in a San Antonio brothel until the age of 17. In between, she was very adept at pawning off stolen good and forging checks. The law caught up to her in 1901 and she was arrested and convicted of train robbery, receiving 5 years imprisonment. She served 3 years and was subsequently released. She must have learned her lesson, however, because she immediately gave up her life of crime and lived her life quietly thereafter.